We are inviting pupils in years 10-13 across Birmingham to take part in our My Wild Future competition to raise awareness of our campaign for a new Environment Act to protect our environment when the UK leaves the EU. The winner will receive support from our Community Engagement Officer and a £400 budget to bring their idea to life. To submit an innovative, creative project idea to tackle plastic pollution in your local area. The best part? Your project won’t just be an idea, the winner will receive 1-1 mentoring and a £400 budget to help put your project into action! See below for competition details, terms & conditions and to download the application form. 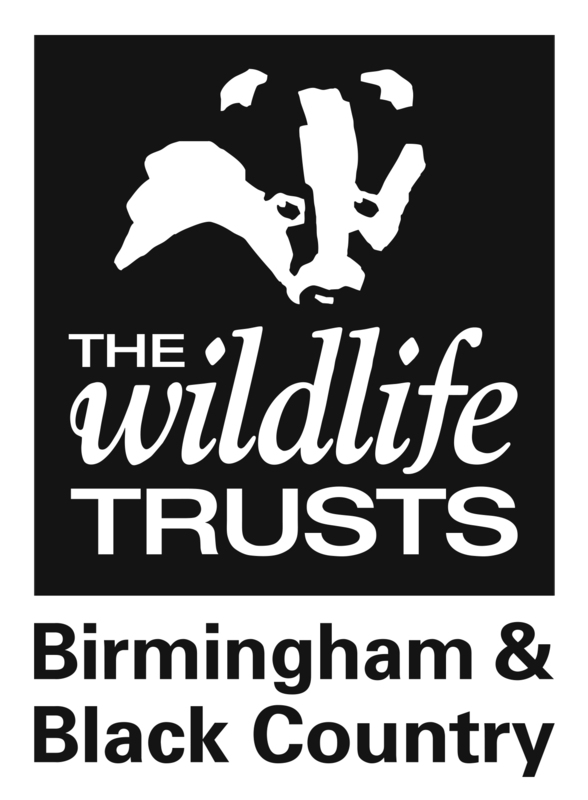 The Wildlife Trust for Birmingham and the Black Country is a charity working for nature’s recovery, leading hundreds of partners, community groups and students to protect, create and improve our vibrant wildlife-rich green spaces. We know that human activities have a massive knock-on effect on nature and wildlife with a significant amount of the plastic in the ocean reported to come from our rivers. The UK is leaving the EU in 2019 which could leave our Environment at risk. This competition is your opportunity to support our campaign for a New Environment Act by demonstrating your support on an environmental issue. All applicants will receive a certificate of participation and applications will be scrutinised by a select team at the Wildlife Trust. Finalists will be invited to pitch their project plan in a detailed 10-minute pitch to a panel of specialist judges. The winner will be awarded with a trophy and the chance to work with our Community Engagement Officer to bring your project to life with a £400 budget. 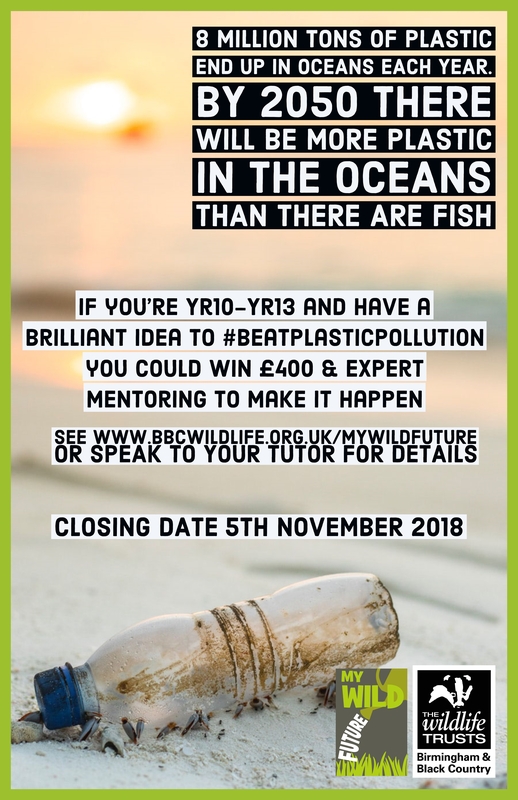 You have a £400 budget to set up a project to tackle plastic pollution in your local area. Your project could identify ways to reduce plastic use, more sustainable uses of plastic, community campaigning, species-focused awareness or something else entirely innovative! Your idea can be as broad as your imagination within the £400 budget. In no more than 500 words or a 3-minute video, we want you to provide an outline of your project plan. Your application can also include optional images or drawings. How is plastic pollution affecting the world locally and globally? In 2016 over 320 million tons of plastic was produced globally, which is set to double by 2034, we want to know how it’s affecting you and your local area. Why is your idea innovative? The aim of this competition is to uncover new ideas for how to improve the plastic waste crisis, so be as creative as you can and be sure to tell us why your idea is a good one. What measurable benefit will the project have on your local community and the local environment? This could include education for people, money saved by your school / college or local businesses and species or habitats protected. How will your idea be managed, delivered and sustained? Judges want to see evidence of the long-term project plans for example; transferring the project to other areas and sustainability beyond the initial funding. Deadline to apply is midnight on Monday 5th November 2018. Applications received after midnight on Monday 5th November 2018 will not be accepted. Applications must be the original work of the applicant. Only one (1) application per student will be accepted. Applicants must be studying in years 10-13 at the time of entry. All application forms must be signed by a named teacher who will act as mentor. All project proposals must be for the geographical area of Birmingham, UK. Finalists will be selected by a panel at The Wildlife Trust for Birmingham and the Black Country. Finalists will be notified by Monday 17th December. The decision of the selection panel is final. Applicants must be available to attend the final on Wednesday 5th February 2019 – the date of the final is not flexible. Finalists will be permitted to bring two family members or friends and to be accompanied by two members of school / college staff to the final. One (1) winner will be selected by a panel of judges at the final with a nominated head judge. The head judge’s decision is final. The prize is a trophy, 14 hours of support from a mentor at The Wildlife Trust for Birmingham and the Black Country and a £400 project budget. The allocated project budget will be managed by the mentor at The Wildlife Trust for Birmingham and the Black Country. The project must be complete by 31st October 2019. Any unspent allocated project budget will be spent by The Wildlife Trust for Birmingham and the Black Country on other community-based environmental projects. No cash alternative to the prize will be offered. The prize is not transferable. In the event of unforeseen circumstances, the Promoter reserves the right to offer an alternative prize of equal or greater value. The Promoter cannot accept responsibility for loss or corruption of applications in transit.